Sukhdev Sandhu and I have organised a day-long celebration of glam, glitter and 70s art pop in downtown New York on Saturday April 29th - with talks involving Mark Dery, Dan Fox, Johan Kugelberg, Vivien Goldman, Sukhdev Sandhu and myself, and the screening of some rarely-seen films from or about the early Seventies. 3:10 - Punk Before Punk: Stomp Rock and Junkshop Glam - conversation between Johan Kugelberg & Simon Reynolds. 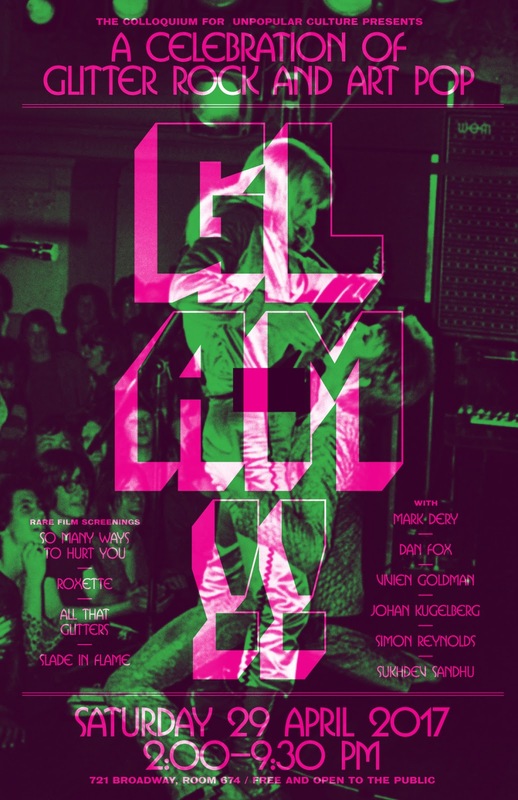 4:55 - “I Felt Like An Actor”: Glam and the Authentically Inauthentic - conversation between Dan Fox and Mark Dery. 7:45 - Slade In Flame (directed by Richard Loncraine, 1975).